Think loss prevention is an insignificant issue? Think again. CCTVFocal enables you to dramatically reduce employee and customer theft, and can help save your business a great deal of money and give you a competitive edge . A camera mounted at the entrance to the area will enable you to monitor and record all vehicles, with their numberplates, twenty-four hours a day. This is used at a number of locations to deter armed robbery and undesirables from entering. Should they persist in doing so you will have a record of when they entered. Until now it has been impossible to adequately cover car parks as conventional cameras cannot achieve facial recognition if viewing an area wider than just two car park spaces. Pan Tilt and Zoom domes can be used but as they are touring the area there is a small chance that they will be looking in the right place at the right time. The unique 21 megapixel SentryScope Camera can cover a large area on a continuous basis and allow the CCTV operator to zoom into recordings and view faces and numberplates after the event has happened. Gaming, vending and cigarette machines can be a frequent target for the criminal element. These can be adequately protected by the use of CCTV. At one site we placed a hidden camera where these were regularly being broken into with the result that the thief was caught within a few days. As receptionists are open to anything from abuse to armed attack we have installed cameras on some sites to give a clear view of everyone standing at the counter. This not only gives a visual record of people as they arrive on site but also acts as a deterrent to criminal or abusive behaviour. Also see the section below on staff fraud. A camera placed within the cash room can deter armed attack or unauthorised staff entry, while a camera outside the cash room can give the staff inside a view not only of who is opposite the door (as does a peephole) but also anyone else in the general area. Working as design consultants with a number of NHS Trusts we are able to draw up professional CCTV specifications and organise tenders for new installations and the upgrade of existing equipment. Our services to the health sector are often free of charge to the end user. Our work includes the design of systems for major hospitals and the specifying of CCTV for a network of clinics and being monitored by a local hospital security department. Until now it has been impossible to adequately large areas and public spaces as conventional cameras cannot achieve facial recognition if viewing an area wider than just two car park spaces. Pan Tilt and Zoom domes can be used but as they are touring the area there is a small chance that they will be looking in the right place at the right time. The unique 21 megapixel SentryScope Camera can cover a large area on a continuous basis and allow the CCTV operator to zoom into recordings and view faces and numberplates after the event has happened. 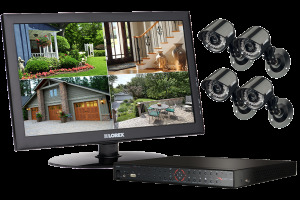 For home and family, we provide the latest and most efficient, reliable and simple home security camera system to help you connect to the things you love. Keep an eye on your home anywhere, anytime from your computer, smartphone or tablet. ..
Now you can respond to emergencies in real time, with alerts and image sent directly to your cell phone. Live access video surveillance lets you peek in on your business anytime to spot audit security problems and keep employees safe. Productive employees are essential to the success of your business. CCTVFocal's advanced surveillance system lets you easily monitor, manage, and address critical issues of absenteeism, workplace violence, and poor customer service . . . from wherever you are, whenever you want..